This piece is inspired by the Queen Mother of Ejisu of the Ashanti Empire –Ghana. She was known for leading the Ashanti rebellion against British colonialism, and is revered as one of Africa’s great female warriors. 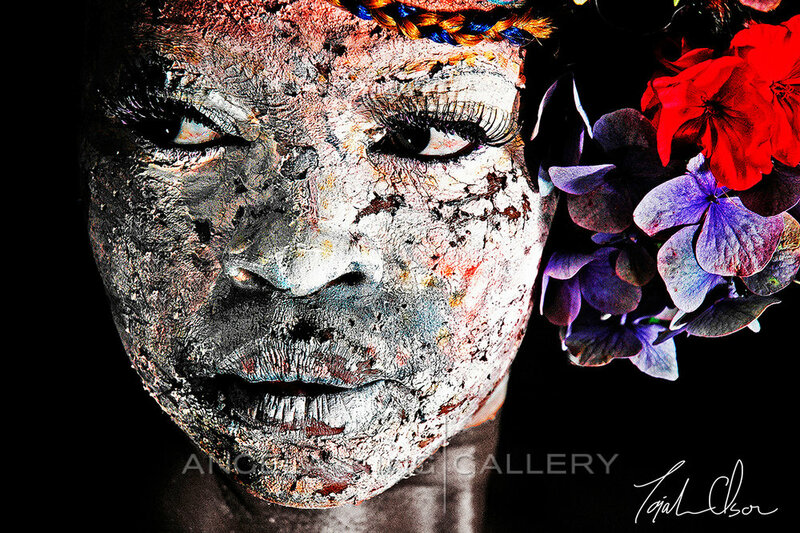 This piece is Inspired by Aja, an Orisha. 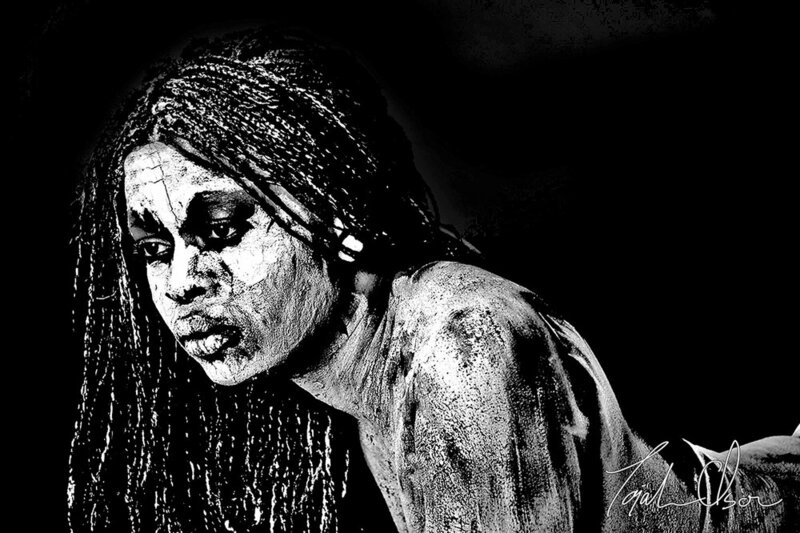 In West Africa, she is known as the Lady of the forest and animals; Aja teaches her followers the magic and curative power of medicinal herbs. This piece is inspired by the Ancient Goddess of Venezuela, Maria Lionza, the highest deity. Once a year, hundreds come together in the mountain rain forests of Venezeula to worship this goddess in a ritual that combines African, Indigenous, and Catholic beliefs. This piece is Inspired by the Under goddess of the Niger River. She is the Yoruba Goddess of weather, air, and fire, of tornadoes, lightning, and strong winds. She is the River Niger, the embodiment of feminine leadership. In West Africa, Ala is known as the Earth Mother Goddess: the female deity of morality, fertility, and creativity in Odinani. Ala rules over the underworld ; she holds the deceased ancestors in her womb. Andriamahilala is inspired by the Queen of Heaven, the first woman according to Madagascans. After populating the entire world with the help of her husband, she retired from her humanity and took on the role of a Moon Goddess. Essien comes from my memories of driving through villages in Southern Africa, where I saw the Tirbal women as they waved and with innocent faces smiled in fascination at the foreign people passing in a car. The name in Swahili means “life”. This piece was inspired by the Massai tribe. The vibrant colors in their clothing and jewelry represent beauty and life. According to the Dinka people of South Dudan, Abuk was The First Woman on earth. The creator allowed Abuk and her husband Garang to each plant one seed of grain each day. One day, however, Abuk grew greedy, and while she was planting more grain, she accidentally struck the Creator on the toe; he was so angry with her that he withdrew from the earth. This piece is inspired by the South African rain goddess Mujaji. To her enemies she gives storms and floods. To her worshippers she gives gentle, prosperous rains. High in political prowess and military might, this queen keeps both the Zulu and the Boers at bay. This piece is Inspired by Nana Buluku, a female deity worshiped in several West African traditional religions as the Supreme Being. She is known among the Fon people in Benin, the Akan people in Ghana, and the Ewe people of Togo. She is well respected as the most influential deity in West African theology. This piece is Inspired by the Great Earth Goddess of Northwest Africa. She brings bounty, fertility, creativity and the cool cleansing energy of the moon. Maui is the daughter of the Supreme Goddess Nana. According to the Rwandans, Nyavire was a Lioness goddess. She was originally the mortal daughter of a tribal chief, but could change into a lioness after she drank lion's urine. When her husband discovered her secret, she killed and ate him. Fatima Tajah Olson hails from the Southeast African country of Malawi. 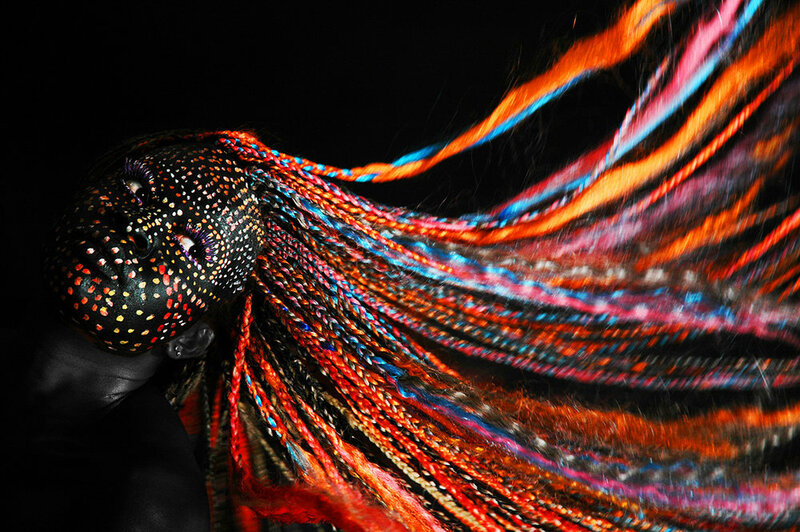 This young artist finds limitless inspiration from the queens of her homeland and the world. 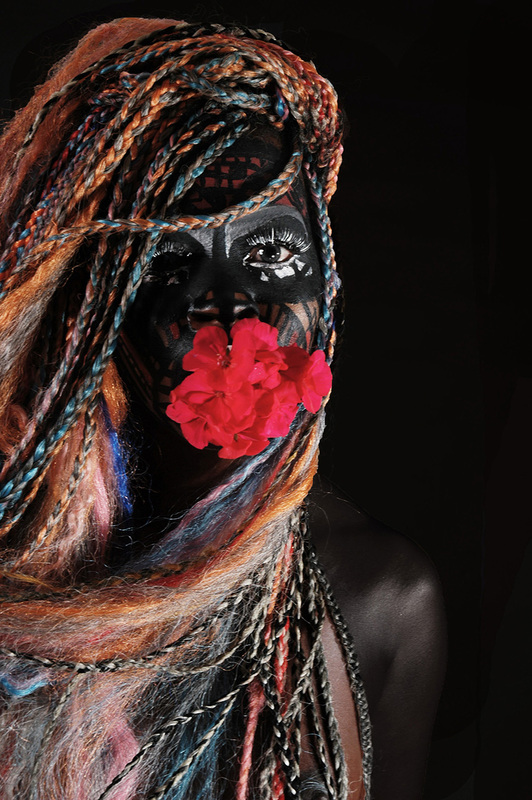 Olson paints her face to pay homage to the power of these Indigenous Goddesses –becoming a new character in each portrait. Angela King Gallery is proud to present Tajah Olson Essence Festival Weekend. Meet the artist 1:30-4PM July 5, 6, and 7th. Click through the slideshow to learn about the origin of each goddess.